The chapter attempts at bringing out an overview of linguistic-based deficits in neurodevelopmental disordered (NDD) population. Clinical linguistics as a discipline has provided a different dimension to view each patient as a distinctive case and has brought out the utilization of comprehensive depiction of individual skill patterns and deficits. As the NDDs are heterogeneous in nature, understanding their language deficits using achievement tests might not provide a clear description of these disorders. Hence, controlled experimental investigations using varied methodological designs could help in tapping their common linguistic variations which may augment key professionals to better identify, assess, and rehabilitate these individuals. 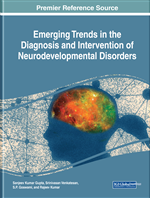 While appreciating all these factors, the chapter provides first-hand information on some of the neuro-developmental disorders and also the language-based diagnostic markers to identify them. Neurodevelopmental disorders (NDD) is an umbrella term used for a group of disorders that includes impairments of cognition, communication, motor skills and general behavior. According to World Health Organization (2002), 1.4% of the world’s population has developmental disabilities and among these 80% of them lives in the developing countries (Morrison & Cosden, 1997). As there are no proven pharmacological treatments for these set of disorders, a variety of early rehabilitation strategies are advocated. These are classified under the disorders of intellectual functioning, communication disorders (Language and speech) and motoric disorders. These may also be able to coexist along with a syndrome where developmental disorders form a part of the symptom cluster, for instance, Down’s syndrome. According to Diagnostic and Statistical Manual of Mental Disorders, 5th edition (American Psychiatric Association, 2013), NDD is broadly classified into intellectual disability (ID)/(Intellectual Developmental Disorders), Specific Learning Disorder, Communication Disorders, Autism Spectrum Disorders (ASD), Motor Disorders and Attention Deficit Hyperactivity Disorder (ADHD). According to Crystal (1986), Clinical Linguistics is the application of the theories, methods, and findings of linguistics (including Phonetics) to the study of those situations where all language handicaps are diagnosed and treated. It is a sub-discipline of Linguistics which involves the application of linguistic theory to the field of Speech-Language Pathology. In other words, it is a branch of Applied Linguistics, used to describe, analyze, and treat language disabilities. Clinical Linguistics has provided a new dimension to view each NDD patient as a unique case and it has brought out the necessity of making full and detailed descriptions of individual patterns of skills and deficits. It has been applied for certain clinical purposes such as helping in revealing the communicative status of the patient’s linguistic patterns. According to the different identifiable types of the linguistic deficit/disorder, it aids in differential diagnosis and categorization of the NDD patient’s behaviors. According to Jakobson (1971) the pathology of language, far from being a random disturbance, obeys a set of rules; the rules underlying the regression of language cannot be elicited without the consistent use of linguistic techniques and methodology. An explicit knowledge of the nature of language, its grammar, and its functioning would be helpful in providing adequate therapies to individuals who are suffering from NDD. Crystal (1984) and Grunwell (1985, 1993) argues that the careful and systematic description of the patient’s communication behavior provides a means of assessing that behavior in relation to linguistic and developmental areas. They suggest that linguistic analysis can reveal the systematic and communicative status of the patient’s linguistic patterns on their own, regardless of considerations of target norms. The insights of linguistic theory and methods also facilitate the formulation of specific treatment aim and strategies for NDD patients. Linguistic analysis at different points during assessment and management process allows the identification and evaluation of changes in the patient’s communicative behavior and it helps to find out which component of language is affected in this kind of population. In a nutshell, Clinical Linguistics can help a professional in effective assessment, description, and management of a wide range of multifaceted disorders such as NDD. The following are some of the disorders which come under the preview of NDD. Hearing Impairment: It is defined as the partial or total inability to hear in one or both the ears due to congenital and acquired causes. Clinical Linguistics: This is a branch of applied linguistics which deals with identifying, describing, and treating individuals with language-based disabilities. This applies linguistic theories to provide solutions for communication disorders. Intellectual Disability: This is one of the major neurodevelopmental disorders which are characterized by significantly impaired mental functioning. They show significant deficits in mental abilities, social skills, and adaptive functioning. These individuals may score less than 70 across a range of IQ tests. Neuro-Developmental Disorders: These are a group of developmental disorders that occur due to high-risk factors during pre, peri, and postnatal time periods. They are known to cause significant disability across language, motor, cognitive, social, and adaptive domains. Grammatical Morphology: A component of language that studies the formation of words, the relationship of each word with other and grammatical rules of word order. Mean Length of Utterance: An indicator of grammatical complexity which is derived by counting the total number of morphemes by a total number of utterances. Language Impairment: An impairment of conceptual formulation and expression of language-based components of morphophonology, syntax, semantics, and pragmatics.